Baylor>Department of Religion>Our Faculty>Faculty>James Kennedy, Ph.D.
Southern Baptist Theological Seminary 1974-1977 M. Div. Jim Kennedy was born and reared in Jacksonville, Florida. Although his formal education occurred east of the Mississippi, he considers it as beginning in earnest when he started teaching at Baylor in 1986. 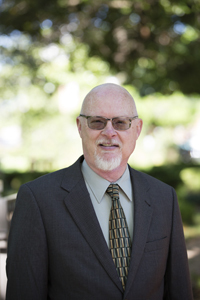 Dr. Kennedy realized early in his undergraduate education at Palm Beach Atlantic College (now, Palm Beach Atlantic University) that he wanted to engage a lifetime of study and teaching of the Bible, particularly the Hebrew documents of the Old Testament. This realization sustained him through the challenging years of theological education in seminary and then graduate school, culminating in the Ph.D. in biblical studies from Drew University in 1986. Dr. Kennedy believes that teaching must involve not only giving information to students in class settings, but in learning with them and so leading students to think of themselves as teachers as well. Teaching is never a one way proposition. Dr. Kennedy enjoys backpacking and hiking in mountainous terrain. He occasionally composes poetry and writes short stories on fantasy themes and enjoys painting and drawing. "The Socio-economic Background of Early Israel's Rejection of Cultic Images," Southwest Commission on Religious Studies/ Society of Biblical Literature, Irving, Texas, March 13, 1987. "Yahweh's Empire: The Social and Economic Agenda of the Yahwist's History," Southwest Commission on Religious Studies/Society of Biblical Literature, Irving, Texas, March 11, 1988. "Peasants in Revolt: A Political-Ideological Reading of Genesis 2-3," Society of Biblical Literature, Anaheim, California, November 21, 1989. "The Roots ysr and 'sr in the Book of Hosea: A Case of Rhetorical Ambiguity," Southwest Commission on Religious Studies/ Society of Biblical Literature, Irving, Texas. March 9, 1990. "O Human Being: The Rhetoric of Iconoclasm in the Book of Ezekiel," Society of Biblical Literature, New Orleans, Louisiana, November 20, 1990. Also presented to the Southwest Biblical Studies Seminar, Perkins School of Theology, October 5, 1990. "Theophany and Anti-Theophany in the Book of Ezekiel: A Reading of Ezekiel 8-11," Southwest Commission on Religious Studies/ Society of Biblical Literature, Irving, Texas. March 16, 1991. "Reading Ezekiel as a Composition," Paper presented as a panelist on the steering committee of the Ezekiel Consultation, The Society of Biblical Literature, November, 1994. "From Textual Chaos to Textual Creation: A Reader-Response Approach to Ezekiel 1, " Society of Biblical Literature, New Orleans, November 25, 1996. "Psalm 24: A Reader's Response," Southwest Commission on Religious Studies/Society of Biblical Literature, Irving, TX, Friday, March 6, 1999. "The Lord's Strongman? The Characterization of Hezekiah in the Book of Isaiah." Society of Biblical Literature, Toronto, Canada. Sunday, November 24, 2002. This paper was also presented to the SWRSBL in March of 2003. "Reclaiming Stolen Thunder: The Book of Isaiah and the Persian Empire," Society of Biblical Literature, Philadelphia, Sunday, November 20, 2005. "The Root G‘R in the Light of Semantic Analysis," Journal of Biblical Literature 106 (1987): 47-64. "The Social Background of Early Israel's Rejection of Cultic Images: A Proposal," Biblical Theology Bulletin 17 (1987): 138-144. "Peasants in Revolt: Political Allegory in Genesis 2-3," Journal for the Study of the Old Testament 47 (1990): 3-14. "Hebrew pithon peh in the Book of Ezekiel," Vetus Testamentum 41/2 (1991): 233-235. "Anub, Azel, Berechiah, Besodeiah," The Anchor Bible Dictionary, Vol 1, A-C. New York: Doubleday, 1992. "Izrahiah," "Joiaim," The Anchor Bible Dictionary, Vol 3, H-J. New York: Doubleday, 1992. "Meshullam," The Anchor Bible Dictionary, Vol 4, K-N. New York: Doubleday, 1992. "Obadiah," "Raddai," "Ram," "Resheph," "Rinnah," "Shaphan," "Shimeathites," The Anchor Bible Dictionary, Vol 5, O-Sh. New York: Doubleday, 1992. "Telah," "Zaham," "Zetham," "Zimmah," Vol. 6, Si-Z. The Anchor Bible Dictionary. New York: Doubleday, 1992. "Yahweh's Strongman? The Characterization of Hezekiah in the Book of Isaiah," Perspectives in Religious Studies 31 (2004): 383-397. "Consider the Source: A Reading of the Servant's Identity and Task in Isaiah 42," in The Desert Will Bloom: Poetic Visions in Isaiah. SBL Ancient Israel and Its Literature. Edited by A. Joseph Everson and Hyun Chun Paul Kim. Atlanta: Society of Biblical Literature, 2009. Pages 181-196. Anderson, Gary A. Sacrifices and Offerings in Ancient Israel: Studies in their Social and Political Importance. Harvard Semitic Monographs, 41. Atlanta: Scholars Press, 1987. In Catholic Biblical Quarterly 51 (1989): 704-706. Coote, Robert B. and Mary P. Coote, Power, Politics, and the Making of the Bible: An Introduction. Minneapolis: Fortress Press. 1990. In Catholic Biblical Quarterly 54 (1992): 318-319. Camponovo, O. et. al. Peuple parmi les peuples: Dossier pur l'animation biblique. Geneva: Labor et Fides, 1990. In Catholic Biblical Quarterly. 55 (1993). Greenstein, Edward L. Essays on Biblical Method and Translation. Atlanta: Scholars Press, 1989. In Hebrew Studies 34 (1993): 136-140. Van der Toorn, Karel. Family Religion in Babylonia, Syria and Israel: Continuity and Change in the forms of Religious Life. Studies in the History and Culture of the Ancient Near East, 7, New York: E. J. Brill, 1996. In Catholic Biblical Quarterly. 61 (1999): 765-767. Black, Fiona C., Roland Boer, and Erin Runions, eds. The Labour of Reading: Desire, Alienation, and Biblical Interpretation. Atlanta: Society of Biblical Literature, 1999. In Catholic Biblical Quarterly 63 (2001): 170-171. Brueggemann, Walter. 1 & 2 Kings. Smyth & Helwys Bible Commentary. Macon, GA.: Smyth & Helwys, 2000. In Perspectives in Religion (30):130-134. Sharon, Diane M. Patterns of Destiny, Narrative Structures of Foundation and Doom in the Hebrew Bible. Eisenbrauns: Winon Lake, Ind. : 2002. In The Review of Biblical Literature, 11/2002. Goldingay, John. Isaiah. New International Biblical Commentary. Peabody, Mass. : Hendrickson, 2001. In Journal of Hebrew Scriptures 4 (2002-2003). Glazov, Gregory Yuri. The Bridling of the Tongue and the Opening of the Mouth in Biblical Prophecy. Sheffield, England: Sheffield Academic Press, 2001. In Review of Biblical Literature, 5/2003. Gottwald, Norman K. The Politics of Ancient Israel. Louisville, Ky.: Westminster John Knox, 2001. In Catholic Biblical Quarterly. 65 (2003): 438-439. Bartholomew, Craig, et. al. eds. A Royal Priesthood? The Use of the Bible Ethically and Politically. Grand Rapids: Zondervan, 2003. In Catholic Biblical Quarterly 66 (2004): 488-490. Øystein Lund, Way Metaphors and Way Topics in Isaiah 40-55 in Review of Biblical Literature Newsletter, 7 November 2009 "http://www.bookreviews.org/bookdetail.asp?TitleId=6915"